Welcome to this episode of the Cookbook Love Podcast. 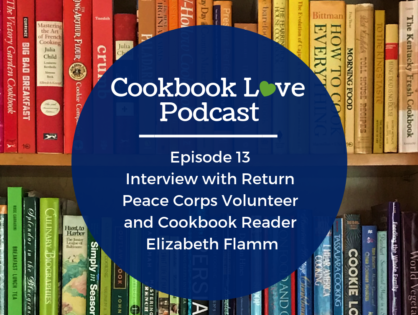 Today I am excited today to interview Cookbook Reader and RPVC (Returned Peace Corps Volunteer) Elizabeth Flamm. Elizabeth was stationed in Koussouka, Burkina Faso for 27 months from October 2012 to December 2014. At the beginning of her training, Elizabeth was given a copy of Where There is No Microwave: A Culinary Survival Guide. Elizabeth read this book cover to cover while she lived with her host family during the initial part of her assignment. Through the reading of this cookbook, Elizabeth educated herself about how to set up a Dutch Oven once in the village, soak beans, prepare grains, and purchase the staples and spices that would soon become part of her day-to-day diet. Since returning to the states, enrolling and graduating from Marquette University, and now serving as the Chief of Staff at City Year in Milwaukee, Elizabeth has begun to appreciate even more reading cookbooks. While not an avid collector, Elizabeth’s story of her time in the Peace Corps, and her reading of Where There Is No Microwave, points to the fact that compiled collections of curated recipes are a tool for teaching and education of cooks, especially when the cook is learning unfamiliar with the food preparation of different cuisines or countries Now with a kitchen of her own, Elizabeth enjoys cooking for herself and her friends, as well as using cookbooks as a tool to learn about flavor profiles, spice combinations, and recipes that produce good results. .